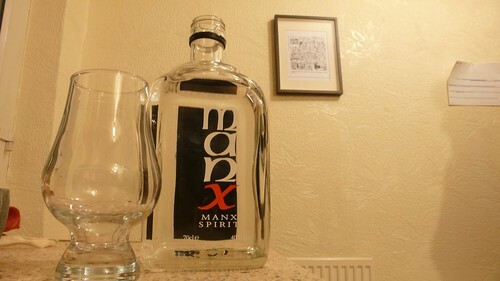 My housemate came back from the Isle of Man, and brought back a bottle of Manx. At first glance, we thought it was new make spirit – whisky that’s not old enough to be called whisky (3 years), but then we looked into it properly and were surprised to learn that it’s not. They make whisky – proper whisky, aged properly – and then put it back in the stills for another go. The result is a colourless spirit that is a remarkably smooth, whisky-like drink. There’s no colour to speak of at all. On the nose, it’s light and delicate. The palate is a little honeyed, but not sweet – and there’s a longish, warm finish. An interesting dram to say the least, and one we were very pleasantly surprised with. You can find Manx Spirit on the Isle of Man – or here at their website.